A pencil that grows! Available with Forget Me Not seeds. An ideal gift for your loved one. Sprout Plantable Pencil, with Forget Me Not seeds. A pencil that grows! 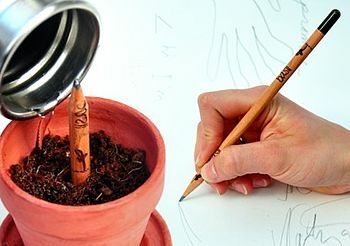 When the Sprout Pencil has served it's function, it can be planted and give life to a beautiful plant. The Sprout Pencil has been given this dual function by replacing the eraser, which usually sits on top of the Sprout Pencil, with a special seed capsule. The seed capsule, which contains high quality, Non-GMO European seeds, is water soluble, making the pencil easy to plant after use.